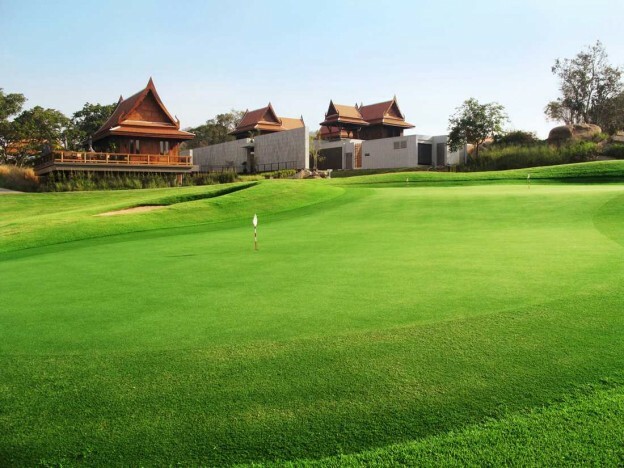 Banyan Golf Club is the newest Championship golf course in Hua Hin and won the prestigious ‘Best New Golf Course in Asia Pacific 2009’ award by Asian Golf Monthly, one of the worlds leading English-language magazines specialized in golf. All the holes at Banyan Golf Club provides spectacular views of both the mountains and the ocean while offering one of the best golf challenges in Hua Hin. The unique contemporary Thai style designed teak clubhouse features luxurious changing rooms, exclusive club suite accommodation and wonderful dining experiences at Mulligan’s Pub and The Terrace restaurant. The rooftop terrace gives you a great view over the 18th fairway and green.